Figure 1: Loss of the molars and second bicuspids, followed by tipping of the remaining teeth, produced a collapsed bite in the patient illustrated here. The arrows demonstrate the loss of interocclusal space which would be required to fit properly sized upper and lower teeth. Such patients can present significant complexities for restoring their dentitions, facial proportions, and temporomandibular joint function; and doing so may require the involvement of surgical, restorative and orthodontic procedures. 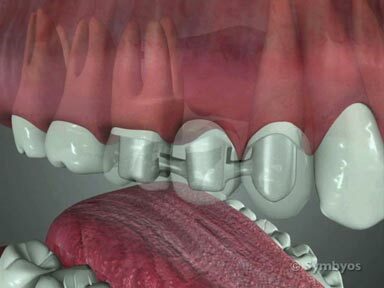 Bite collapse (also known as loss of vertical dimension of occlusion) occurs in one of two situations. In the first, the patient grinds their teeth so aggressively, and reduces the biting surfaces so extensively that the upper and lower jaws rotate closer together than normal (Figure 2). 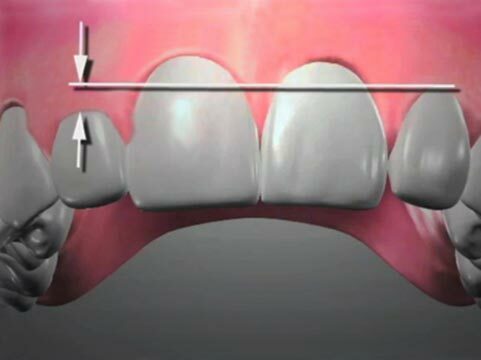 It is important to note that there is significant professional literature refuting that excess wear leads to bite collapse, citing the tendency of teeth to move toward each other (extrude) as they wear. However, aggressive tooth grinding can certainly destroy tooth structure at a greater rate than extrusion can compensate for. Bite collapse can also happen in patients who do not grind their teeth. This occurs when enough teeth are lost that the remaining teeth and supporting (alveolar) bone are unable to withstand even normal biting forces, and begin to tip sideways, resulting in over-closure of the jaws (collapsed bite). Causes of multiple tooth loss include extensive tooth decay (caries) and periodontal disease. If the teeth in one jaw no longer have opposing teeth in the other jaw to bite against, they will often extrude (supererupt). Sometimes they can keep extruding until they are functioning on the gums of the opposing jaw. Generally, as they extrude, the bone and gum tissue which surrounds them extrudes along with them. The result is a dental bite relationship which requires complex rehabilitation to correct. This can involve many of the surgical and restorative procedures available to dentists. Figure 2: Severe attrition of this habitual tooth grinder (bruxer) has led to bite collapse. Severe attrition like that shown in Figure 2 can be a serious problem. It can result in damage to the jaw joints (TMJs); severe pain or dysfunction in the jaw joints (TMJ dysfunction); frequent muscle tension headaches; excessive muscle contraction forces as the closing muscles of the jaw shorten (which can accelerate the destruction); tooth fractures and tooth loss; aggravation of periodontal disease if present (secondary occlusal trauma); shortening of the lower face height (which can change one’s appearance, although it may not be obvious to a casual observer); an inverted smile (corners of the mouth sag); a toothless smile; frequent cracking or chapping at the corners of the mouth (angular cheilitis); and problems chewing. How does the dentist diagnose Bite Collapse? Tooth enamel is extremely durable, and under normal function will provide a lifetime of service without measurable wear. Concentrated forces can accelerate wear of tooth enamel, and primarily occurs in two situations: normal forces on poorly aligned teeth; and heavy forces on normally aligned teeth. When attrition (wear) is severe, a patient will often complain to their dentist about “short teeth”. Often, these are patients who have not undergone regular dental care in the past, and no one has been monitoring the demise of the teeth. Some patients report pain in the jaw joints or facial muscles. Another common complaint is frequent muscle tension headaches, and fatigued jaw muscles. Many people attribute the shortened lower face height to age, missing the connection to their short (or lost) teeth. The challenge for dentists is to recognize and treat the early signs of bruxism (tooth grinding) before the damage becomes as severe as that shown in Figure 1. It is also important to be proactive about preventing loss of teeth, and to make a priority of replacing teeth when they are lost. One thing that complicates a diagnosis of bruxism is determining when the damage occurred, so that restorative procedures to correct the vertical dimension of occlusion can be successful long term. Many patients go through stressful periods in their lives when bruxing is a problem. Sometimes the habit resolves on its own after the stressful events have passed. Another problem is that people who have a habit of tooth grinding frequently are unaware of the habit, which may occur while they are sleeping. Home screening tests are available for determining whether a tooth grinding habit is active. They are purchased directly from the manufacturer, and consist of single-use EMG (electomyography) strips applied to the corners of the jaw over the chewing muscles, that record muscle activity on a permanent electrochemical indicator as the patient sleeps. Photographing the extent of wear at checkups is one way to establish whether or not a patient is actively bruxing. Another way is to make casts of the teeth of a suspected bruxer, and compare them with the patient’s actual teeth over time. Diagnosing bite collapse in patients who have lost multiple teeth can involve use of articulator-mounted study casts of the teeth (an articulator is a hinged jaw simulator); a visual evaluation of the remaining teeth (e.g. for chips, craze lines, cracks, wear planes, etc;) an evaluation of the jaw joints for clicking, popping, locking and/or pain; analysis of the facial profile, and soft tissue measurements (e.g. distance between the point of the nose and tip of the chin); resting and smiling lip positions; bite relationship (occlusion); and possibly use of neuromuscular monitoring equipment. Proponents of neuromuscular monitoring state that abnormally high muscle forces and activity can be measured, and are caused by shortening of the jaw closing muscles as teeth are lost and the jaws rotate together. Those who oppose neuromuscular monitors claim the devices can be used to exaggerate the need for treatment, when the patient has no symptoms or other clinical signs of bite collapse (generally not the case when multiple teeth are lost). Regardless of the equipment used, it is a good idea to understand the factors contributing to your diagnoses; the risks, intended benefits, and consequences of treatment (as well as electing NOT to be treated); any available treatment options; and the urgency for treatment. How is Bite Collapse treated? Figure 3: The same patient from FIgure 2, before treatment for bite collapse. Treatment of bite collapse is generally divided into three categories—treatment of the damage to extensively worn or broken teeth; re-establishment of the proper vertical dimension of occlusion and proper distribution of bite forces over as many teeth as possible—which may mean replacing teeth. Tipped or displaced teeth may require orthodontic uprighting, and missing teeth should be replaced. If an ongoing tooth grinding habit is suspected, the dentist may recommend use of an occlusal guard. To repair the damage, fillings, onlays and/or crowns may be recommended. Figure 4: The patient is shown with temporary veneers in place. The back (posterior) teeth have been rebuilt with direct composite restorations of the biting (occlusal) surfaces of those teeth. Figure 4 shows the patient from Figure 3 in temporary veneers. The patient wears the temporary restorations long enough to assess whether the correct vertical dimension of occlusion has been re-established, to monitor symptoms for resolution, and refine the cosmetic results (for example, tooth size, shape, shade, etc.) prior to final crown fabrication. Determining whether the vertical dimension is correct involves an evaluation of patient comfort at the new jaw position; wear and function of the temporary restorations; and assessment of the jaw joints (are they free of pain, popping, clicking, etc.?). The patient may be in temporary restorations for several months while these factors are considered, before final restorations are completed.